In the Darent Valley, on the railway line from Bromley to Sevenoaks, lies the village of Eynsford. It's a picturesque spot, nestled in a curving Kentish valley with a river trickling through. So nice in fact that important people have been drawn to live here for almost two millennia. 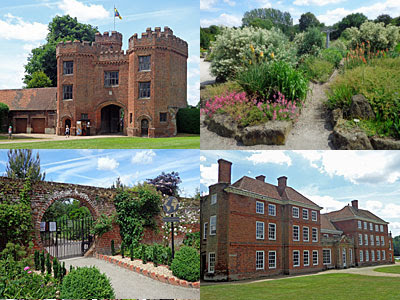 Two top attractions lie within half a mile of each other along a rambling lane, on the Lullingstone banks. You so very should. It's not so much a castle as a manor house that got a bit big. The gatehouse is early Tudor, in what was then cutting-edge brick, while the house itself is late Stuart. King Henry VIII was a friend of the owners, while Queen Anne was such a fan she used to stay over. Make sure you're here at 2pm on the right days of the week and you can go on a tour of the house. Nineteenth generation owner Guy Hart Dyke even stands in the lobby and sells books and ice cream, or at least he did yesterday. Climb the staircase whose treads were made shallower so that portly Queen Anne could get upstairs without panting. See the barrel-roofed Elizabethan gallery which was once a silk farm and whose moths helped produce a gown for our Queen's coronation. And yes, there really are two cardboard cut-out meerkats in Queen Anne's bedroom, because last year's TV insurance advert was filmed here. We're told that the rules of lawn tennis were invented on the grass outside, We're told that the medieval flint church has some of the oldest stained glass in the country. We're told that land on the ridgetop behind the house was nearly appropriated for London's fourth airport, until WW2 and the Green Belt intervened. And really, it's a fascinating place to poke around. But the biggest attraction is the gardens, and in particular the World Garden designed by Lullingstone's heir Tom Hart Dyke. He's a keen plant collector, so keen that in 2000 he got himself kidnapped on an orchid hunt in central America. It was during this enforced capture that he came up with the idea of a garden laid out like the continents, with every plant in its rightful place, and when he got home he set about building it. The old walled garden was appropriated, and beds constructed in approximate spatial orientation, although the UK and New Zealand are rather larger than they ought to be, and Asia rather smaller. It's an impressive and unusual feat, as you might know if you watched the BBC TV series a few years back. Everything's labelled with name and location, and there are overgrown paths to follow through the middle of each continent where the foliage and flowers have been allowed to grow over. I suspect a sunny midsummer day is the best time to see the place in bloom, not just for humans but also for the multitude of bees lapping up the local nectar, and the dragonflies, so many dragonflies. By contrast the Canary Islands go back into a greenhouse in the Autumn, while Mexico is preserved through the winter beneath a protective polytunnel. Tom has set up a Cloud Garden in the area immediately beyond, with a steaming pool, although it's not quite as exciting as any of that sounds. Another greenhouse contains some amazing cacti, leading through to an understated cottage shop where you can buy pots to takeaway. Don't come to the World Garden for layout tips, it's a bit higgledy-squashed. But with 8000 plants to peruse, gardeners are bound to find something here to inspire. During the later years of the Roman invasion of Britain, the Darent Valley was the equivalent of Millionaires Row. Several Mediterranean-style villas were built here, lured in by the river, lush meadowland and proximity to the southeast. 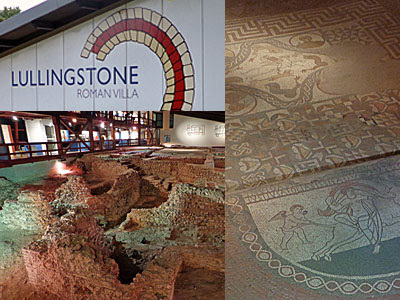 Lullingstone was home to one of the best preserved, uncovered in a decade-long dig staring in 1949. English Heritage are the latest owners, and recently did up the visitors centre to create a better experience. You're walking down this dead end lane and suddenly there's a long low shed set into the side of the slope. £6.20 gets you inside, out of the sun, where you'll see the extensive foundations of the former villa. The villa grew over the space of three centuries, starting off fairly normal and adding extensions as the years go by. Down one end are the remains of the baths, with a cold, a tepid and a hot room - a luxury facility equivalent to having your own swimming pool in the back garden today. In the centre by the dining room is a mosaic pavement, still mostly intact, featuring the story of Jupiter seducing Europa while disguised as a a bull. Other areas they're less sure about, including one labelled "Possible Bedroom", and a deep cellar which may have been used in the later years to worship non-Christian gods. The displays are good, mixing just enough detail with just enough simplicity, and include a selection of finds from the family mausoleum. Some are tiny and ornate, one is a board game complete with etched counters, and then there's the skeletal remains of a 24 year old man scattered in a decayed coffin. Every 40 minutes or so they dip the lights and screen a short film, but the rest of the time you're free to explore (on two levels of gangways) and to stare. The two Lullingstones are the prime attraction, but if you're making a day of it you should also take a little time to admire Eynsford village. The lane from the villa ends at a narrow hump backed bridge and ford, beside which yesterday the entire under-ten population appeared to be having a great time paddling, dangling and fishing with nets on sticks. To find the castle, turn left and look for the alley opposite the Castle Hotel. Cross the wooden bridge and pass between the curtain walls, to see the remains of a Norman enclosure-style fortification. It's mostly the flint walls that have survived, enough to delimit the hall and kitchen, and with a few steps to descend into lower level rooms. Yesterday two lads turned up to smoke weed perched atop the solar undercroft, while four more demure teenagers picnicked in the Darent-side meadow. Come next Sunday morning and parishioners will be holding an outdoor service amongst the stones. Come almost any other time, and you'll likely have this long-standing ruin mostly to yourself.